The Frugal Family Life: Savingtar: 20% back on FRESH Bananas + 25¢ back from Checkout51! Savingtar: 20% back on FRESH Bananas + 25¢ back from Checkout51! This week’s healthy SavingStar offer is a nice one! Just purchase bananas at any participating SavingStar retailer by 9/1/14 to get 20% of your purchase price back. 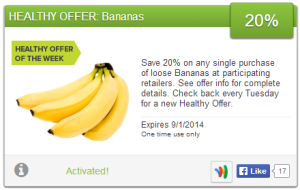 Plus, not only do we get the 20% back for buying bananas, but you can also request 25¢ from Checkout51 through 8/27/14. I can’t pass up this offer as much as my girls like bananas! I’ll be taking advantage of this for sure!